Press Release - Office of Member of Madang. In a press conference this week, Member for Madang Hon. Bryan Kramer announced what he calls a ‘major political shift in the way political parties are configured and operate in PNG’. Mr Kramer was flanked by President of PNG Constitutional Democratic (PNGCD) Party Ila Geno. 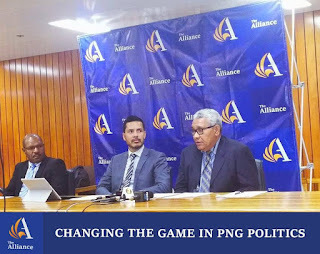 The party’s Chief Legal Counsel Nemo Yalo was also present for the inaugural pronouncement of the new name and brand of PNG’s newest political party; “The Alliance”. Mr Ila Geno is a former PNG Police Commissioner and PNG Chief Ombudsman. Mr Nemo Yalo is former Chief Counsel of the Ombudsman Commission. Yalo an Acting National Court Judge also co-founded the PNG Constitutional Democratic Party with Ila Geno in 2010. The new Madang Open MP Hon. Bryan Kramer; a renowned political strategist spearheaded the plan to merge numerous one-man political parties by convincing both Geno and Yalo to offer their party as a vehicle. The ambitious strategy to consolidate the existing eight political parties in Opposition into a two party partnership is intended to offer greater political certainty in PNGs fluid and turbulent political landscape. After the 2017 General Elections an opposition coalition was formed amongst 9 political parties as a bloc in readiness to form PNGs next government after the elections. This bloc was called ‘The Alliance’. This week’s announcement formalizes the transition of The Alliance as a brand previously presenting as an opposition bloc to its new status as a registered political party. “Political Parties form the cornerstone in any political system. However too many political parties fracture and segment the system and this promotes dysfunction.” Kramer said. Mr Kramer explained that PNG has 45 registered political parties 21 of which make up the parties in 10th National Parliament. Thirteen parties make up the Government Grand Coalition with 8 in the Opposition. “In short we are changing the game of politics in PNG by working with other competent political party leaders in the opposition to collapse their party on an interim basis to group under a single common political agenda – to provide credible alternative leadership to address PNGs serious political, economic and social issues and challenges” Kramer said. “Rather than register a brand new party adding to the existing 45 political parties a strategic decision was made to use an existing party” Kramer said. Kramer explained there are ten Members of Parliament who have confirmed that they will join the party. The Alliance party’s leader, its members and policy platforms will be announced at the official launch to take place in February 2018 during the next parliament sitting. I’ve been tasked to move ahead and lay the ground work to establish the party machinery, logo, and membership base that will embolden the Alliance Party’s presence as a force in Papua New Guinea’s changing political landscape.” Kramer concluded.